The International Vienna Motor Symposium, which took place last week, is open to all carmakers, and nearly all of them attend, but it’s always Volkswagen that is leading in Austria. The German giant has announced four important news. The first one is about a new strong diesel. 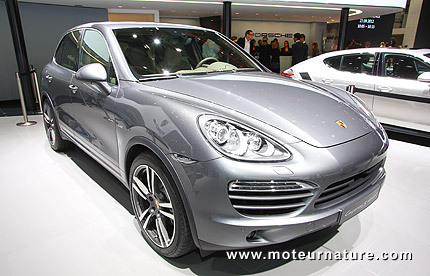 Our left illustration shows the Porsche Cayenne S V8 diesel, which was launched at the Paris motor show last year. Some people thought at the time that there was no sense making such an expensive and fast diesel like that, but it turned out to be hugely successful. Porsche sells all it can build and buyers must face a long wait to get one. Not that it was needed, but that’s another argument for Volkswagen to keep on working on strong diesels. The manufacturer will soon introduce a diesel that will crack the 100-kW per liter barrier. There’s no word about size, but we can imagine a 270-hp inline four turbocharged diesel. On the transmission side, Volkswagen said it was working on a ten-speed DSG transmission. Twin clutch transmissions are known for their fast gear changes, that quickness will be much appreciated here. I bet this gearbox will allow motorists to develop super efficient engines with a very narrow powerband. Volkswagen then promised Internal Combustion Engines (gas and diesel) should gain another 15% improvement in fuel economy by 2020. But nobody should expect a revolution. This progress will come from better thermal management, friction reductions, sharper controlling and even higher compressions for fuel injection systems. Volkswagen said those could go up to an absolutely incredible 44,100 psi. The last news is that besides traditional liquid fuels, Compressed Natural Gas should get much more popular than it is now. Volkswagen has already launched a CNG version of its Up! small car, and it will start selling the CNG Audi A3 this year. In Germany and Italy, and in all the other countries that support natural gas as an automotive fuel.